Japanese Prime Minister Shinzo Abe, left, shakes hands with Russian President Vladimir Putin prior to their talks during the G-20 Summit in Antalya, Turkey. New Japanese Ambassador calls for strengthening of bilateral dialogue. Strengthening of the bilateral dialogue between Russia and Japan would lead to increased stability and prosperity in East Asia, Toyohisa Kozuki, Japan’s new ambassador to Russia said on Dec 27. 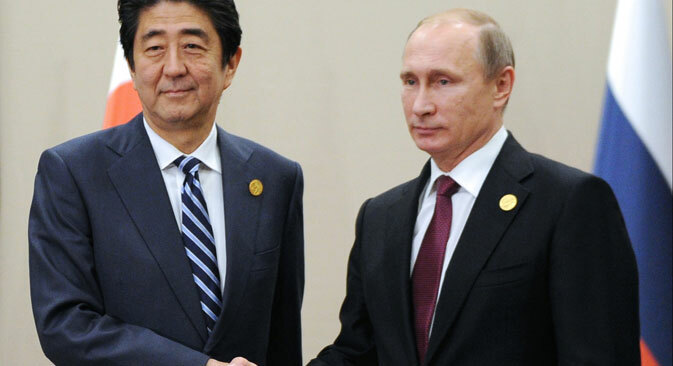 Russia and Japan bear "great responsibility for the stability and prosperity in the East Asian region," Kozuki told Sputnik News. Russian President Vladimir Putin’s trip to Japan was put off indefinitely after the two countries failed to make progress in resolving the Southern Kuril Island territorial dispute.